Raith Rovers request for an away league opener has been granted. The fixtures for the 2018-19 SPFL Ladbrokes League One season were released this morning, and handed the Kirkcaldy side a trip to Stranraer to kick off their title quest. Rovers had asked the SPFL to avoid a home opener in order to provide an extra week to complete the installation of an artificial pitch at Stark’s Park. The first match on the new £700,000 surface is likely to be the following week, Saturday, August 11, with Stenhousemuir the visitors in the opening home league game. 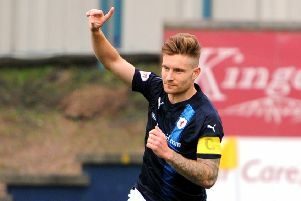 Rovers then head straight into a home derby the following week against local rivals East Fife, who this week signed striker Jonny Court following his release from Raith last month. The traditional New Year derby is scheduled for Saturday, December 29 at Stark’s Park, while Raith finish the campaign with a trip to newly promoted Montrose on Saturday, May 5. To download our graphic featuring the full fixture list head over to our Raith Rovers FFP Facebook page.